1) On the Google Sheets app page in Coinigy, click the orange 'Open Template' button under step one. This will open up a viewable, read-only Google sheet. 2) Make a copy of this sheet and save it to your personal drive. 3) Open your personal saved copy of the sheet and switch to the 'Config' tab sheet. Here, enter in your Coinigy API key and secret. 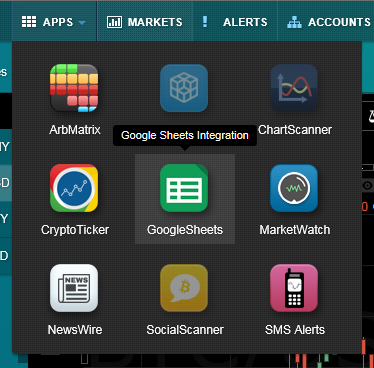 4) From there, switch back to the 'Coinigy Enabled Sheet' and start building your sheet as necessary. =CoinigyGetAccounts() - Lists all attached Coinigy accounts. Use this to find your auth_id for use of other functions for a desired account. =CoinigyGetAccountBalance(auth_id, A1) - Returns total balance in BTC for specified account. =CoinigyGetBalance(auth_id, curr_code, btc, A1) - Return total balance for specified account in either native currency (btc=false) or in BTC value (btc=true).